Hey there. Running on a Chromebook with Linux. This game looks lovely, runs fine and everything is rendered beautifully BUT! I don't hear any sound or music. Any ideas? Beautiful sky! I'm amazed with how the colors change, in both the sea and the sky. I really like the detail in the clouds, only caught that later. (1) I think the lighthouse's light is a big problem. It doesn't look very good (too strong), and seems such as important effect to nail, since it is towards the "end" of the game (assuming people will play through once to see everything). Sticks out a lot in an otherwise great looking place. (2) I think you should relocate the upper door of the light-house, or adjust the music? I like the build-up, but it would be much better if the "climax" happened when the player looked through the door at the world. As it is, it happens when he reaches the top of the staircase, but only looking at a wall. The game world is relatively small, yet I spent 3 hours immersed in this poetically captivating experience, whereby I simply walked around repeatedly & stared at everything for long minutes. My only disappointment is that the game doesn't seem to allow me to get over to the opposite island with the houses near the headland, because I'm curious to check if that is the spot marked X on the wooden chest map. Really pretty and relaxing, I loved walking around and just looking at all the set pieces. <3 Can't wait to see what you release next! Thanks for the beautiful, chill, relaxing experience you produced in this game. Kinda confused at first, but yeah. Everything is good in here. If any of you that curious about this game, check my test in here . Thanks. Ever since I was a little girl, lighthouses often appeared in my dreams thanks to my nana. She had dozens of books, sculptures, and trinkets of lighthouses all over the states. Sometimes, I wondered what life would be like if I had a small island with a lighthouse of my own to vanish to, for when life was too noisy to handle. Beautiful looking game. Added my own music if that's ok for my video ? Very calming! Would be intrested to see more of these calm solitary spaces show up in games . . .
Oddly calming. However the zoom feature with the scope was too sensitive. It would be much better if when zoomed in it lowered the sensitivity. Other than that it was a nice 8 minute walking simulator. On Windows Build, played on Windows 7 with an HD3000 intel graphic card (1.5 GB Ram, DirectX11/OpenGL 3.3 compatible, and driver version 9.17.10.4229), I see that in the main menù and also in-game many models are not rendered at all (change quality or resolution settings doesn't make any difference). Thanks for your attention and your work. Older-generation Intel HD Graphics GPUs don't seem to support the game fully. If your system has dual GPUs, instead of using the integrated Intel GPU, switch to the higher-end discrete GPU (updated with the latest possible driver) before launching the game. Switching the GPU during the gameplay itself has no effect. Very nice art and atmosphere, I've made a little story around it! Thanks for making the game! EVERYTHING WAS GREAT ! JUST LOVED IT! I love this, great concept and everything, it's perfect.. But only one problem, I'm an extremely awkward person and I need the Y axis to be inverted.. Can you add an option to that? Probbably not the most interesting thing but I made a 9 hour screensaver of view from the lighthouse showing the island and the day/night/cycle. I like it though. I played this the other day and totally enjoyed it. The graphics are spot on and even thought it's short I can't fault it. You really do need to expand this into something bigger though but thank you. Awesome. really liked this a lot. I think adding sensitivity options would help me enjoy it a bit more: walking up the steps so quickly made me a little motion sick. Works just fine on Arch Linux, including XBox 360 controller. If you end up doing another build I would definitely appreciate being able to disable the bloom. It makes it very hard for my eyes to focus on things. Loved it! It is so pretty! I was really surprised at how much I enjoyed this game. It was a nice change to what I normally play. I made a video so this game can reach I wider audience because it deserves it. Hope you enjoy. Thanks for playing and for giving a try to something different from what you usually play! It's such a cute game, and while it's very relaxing to just stand around somewhere (I most like the little island in front of the beach) I'm really missing a key to just sit down, even if it just lowers the camera. I instinctivally want to sit down everywhere to just get the feeling of relaxing, more than just standing still. Thanks for the feedback, a key for sitting down is a great idea! I don't know why I haven't though of that before! I'll add that when I update the game. Would love to be able to sit down in places or take a dive. Cute shaders and art. 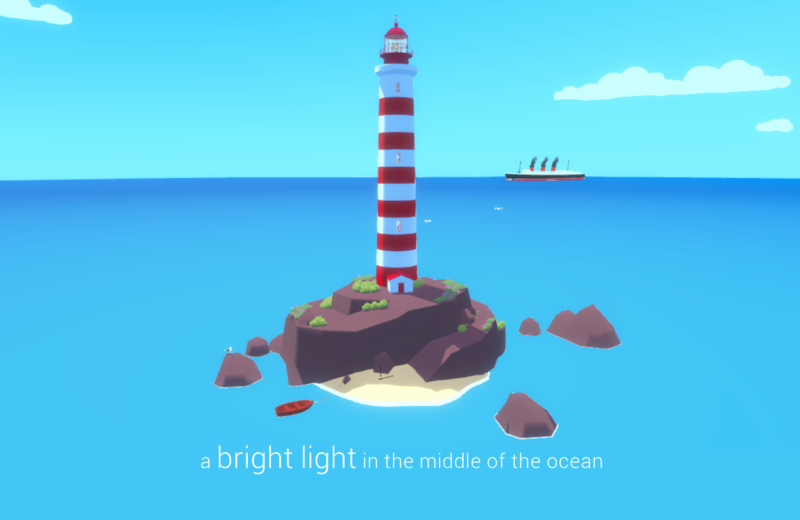 The lighthouse light was very abrasive, but overall a cute game. I'd love to be able to go the town. Sorry I have no idea what could cause that, since no one else reported the same problem. It seems there's no light but I don't know why. I'll fix it if I find out what's the problem, but I'm not very confident that I will find what is the problem. I'm on a slightly older laptop with Intel graphics, if that helps narrow it down? Is there a log file or some other debugging information I can help you with? @ Enno -- Older-generation Intel HD Graphics GPU doesn't appear to support the shader effects required by the game. This could be why there is no ambient light (except for the "glowing" ocean) in the game. ERROR: Shader Shader is not supported on this GPU (none of subshaders/fallbacks are suitable)"
You're right, that's exactly the error I see in the log. ERROR: Shader Shader is not supported on this GPU (none of subshaders/fallbacks are suitable)WARNING: Shader Unsupported: 'Hidden/BilateralBlur' - Setting to default shader. My Laptop's Intel HD 3000 graphics are a few years old, true, and it's by no means a gaming machine (below 1% in the Steam Hardware Survey), but so far, yours is the only game on itch that I've had problems with. @ Enno -- My integrated GPU is Intel HD Graphics (ie. the 1st generation, older than your GPU), which doesn't work properly with the game. Luckily, I have a discrete AMD GPU that I could switch to in order for the game to render properly. But the GPU switching must be done before launching the game, because switching the GPU during gameplay has no effect. That being said, like you, this game is the first & only one to date that my integrated Intel HD Graphics GPU (enabled by default) has problems with. Perhaps it's because unlike other Unity games that I'd played, the only 'Graphics Quality' options provided in the Unity settings panel upon first launch of this game are restricted to: Good, Beautiful, & Fantastic -- with no lower options such as: Fastest (which I prefer), Fast, & Simple. Maybe the game developer @Fi Silva can consider making lower graphics quality options available, especially for players without a higher-end gaming GPU to switch to. Very relaxing, and the music was beautiful. Great job! This is such a nice concept! Thank you for making this, I love the colours, design, and aesthetic! Well done! Relaxing and pretty experience. I was delighted to find a treasure chest too.